LactoSpore® is Biomed’s probiotic of choice, and we want you to know exactly why we choose to use this particular probiotic preparation in our range of supplements. LactoSpore® is a probiotic preparation containing the lactic acid forming microorganism (often called a “probiotic”) Bacillus coagulans or B. coagulans for short. Bacillus coagulans are rod shaped, gram positive, endospore-forming bacteria that grow optimally at 37°C and at a pH in the range of 5.5-6.2 (slightly acidic). Bacillus coagulans was originally known in literature as Lactobacillus sporogenes and both of these terms are still used in literature interchangeably. The human digestive tract contains around 400 different bacterial species that reduce the growth of harmful bacteria and promote a healthy digestive system. Lactic acid producing bacteria are by far the largest inhabitant group amongst them all. Given the pressures of a modern lifestyle, it can be a tricky task to maintain a normal, healthy and balanced microbial population in the digestive tract. In fact, most of us have a smaller variety of bacteria in our bodies than our great grandparents did. From the foods we eat, to the medicines we take, and even increased stress levels our modern lifestyles mean that some of those good bacteria are being killed off. Additional factors that might make this task even trickier are stress caused by sudden changes in food consumption patterns, exposure to environmental pollutants, extensive travel and unexpected changes in weather. Therefore, under such adverse circumstances, the harmful bacteria may become predominant (a condition referred to as “bacterial overgrowth”) and create an imbalance, which may in turn impair normal gut function and lead to various problems, ranging from inefficient digestion, diarrhoea, constipation and flatulence to severe gastro-intestinal disorders. So what can we do to bring some of those health boosting bacteria back? A logical approach to restoring the balance of intestinal flora would be the use of naturally occurring microorganisms. A superior and potential species among Lactobacillus is Bacillus coagulans. This species forms spores, which on activation in the acidic environment of the stomach, can germinate and proliferate in the intestine, produce the favoured L (+) form of lactic acid and effectively prevent the growth of pathogens (harmful bacteria). Probiotics are known to stimulate the growth of other beneficial bacteria like Faecalibacterium prausnitzii in the human gut. Thus, establishment of a healthy microflora eventually helps in reducing toxins as well as the growth of other bacteria / viral pathogens. In addition, probiotics also facilitate elimination of acids, antibiotics and other substances that might compete for colonisation sites and nutrients (Keller et al., 2010). Probiotic strains can produce short-chain fatty acids (SCFAs), the benefits of which have been summarised in the figure below (Kasińska and Drzewoski, 2015). 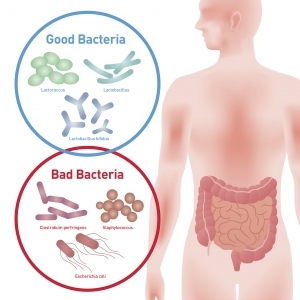 What makes LactoSpore® our Probiotic of Choice? There are several reasons why LactoSpore® is the probiotic of choice and a superior species among Lactobacillus. As a probiotic, LactoSpore® has a host of potential health benefits including the normalising of the gut flora which may provide relief from digestive discomfort (flatulence and bloating), lactose intolerance symptoms, Irritable Bowel Syndrome (IBS) and Inflammatory Bowel Disease (Crohn’s Disease and Ulcerative Colitis). Furthermore, LactoSpore® may be beneficial in Non-GI tract conditions such as urinary tract infections, non-specific vaginitis, hyperlipidimia and hypercholesterolemia, hypertension and respiratory tract infections. Due to the spore-forming nature of LactoSpore®, it is resistant to most chemical and physical conditions (e.g. acid and heat) and therefore is able to survive manufacturing, shipping and storage with no loss of viable count. Furthermore, LactoSpore® is room temperature stable and does not require refrigeration conditions. Bacillus coagulans is able to survive and flourish in the gut through the mechanism of competitive exclusion. There is first a competition for limited nutrients by all bacteria, the acidic environment created by the production of (L+) lactic acid prevents the growth of pathogenic microbes and allows growth of Bacillus coagulans which ultimately dominate the microflora. In addition, Bacillus coagulans also produces Bacteriocins (antimicrobial proteinaceous compounds) that are inhibitory towards both Gram (+) and Gram (-) bacteria. In December 2008, LactoSpore® was self-affirmed GRAS (Generally Recognized As Safe) by an independent panel of recognized experts qualified by their scientific training and relevant national and international experience to evaluate the safety of food and food ingredients. “Helps relieve abdominal pain associated with IBS (Irritable Bowel Syndrome)”. LactoSpore® has also been accepted for deposit in the Microbial Type Culture Collection (MTCC) and Gene Bank. The (MTCC) and Gene Bank is a national facility funded jointly by the Department of Biotechnology (DBT) and the Council of Scientific and Industrial Research (CSIR), Government of India. The main objectives of this national facility are to act as a depository, to supply authentic microbial cultures and to provide related services to the scientists working in research institutions, universities and industries. The microbial culture was accepted for deposit in MTCC-IDA, was assigned MTCC number 5856 and preserved in the patent collection of MTCC on 19th Sept, 2013. 2) Majeed M., Prakash L. LactoSpore: The Effective Probiotic; NutriScience Publishers Inc.: Piscataway, NJ, 1998, 56 pages. 3) Abstracts of papers on the clinical study of Lacbon (Sporlac), compiled by the Sankyo Co. Ltd. Japan. 5) Mohan J.C., Arora R., Khalilullah M. Indian J. Med. Res. 1990, 92, 431-2.